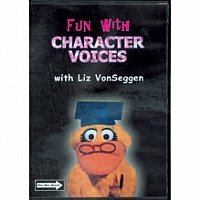 This DVD by Liz VonSeggen offers training in developing voices for your ventriloquism characters and live puppet voices. These are unique skills that set one apart from regular performers. Liz introduces you to six different voice types using an entertaining mix of puppets and helpful pause and practice screens.